Thought that the CCHD is ok after the expunging of ACORN? No way! Watch the following. This November 22, boycott your parish CCHD collection. I and a number of others had reason to visit Chicago. This morning we attended the 7:15 am Mass at the above-named church. It is staffed by Franciscans and one said the Mass. The Gospel for today was the same one for this past Sunday, where Our Lord tells His disciples not to silence anyone who speaks in His name. Well, the priest took this to mean that we must not be "arrogant" and insinuate that "our truth is the right truth". Does anyone recognize the heresy of indifferentism here? How about the lack of simple logic? Let's illustrate the lack of logic. Say I make the following statement. "There is no truth." Now think about that for a minute and you'll see the paradox. If indeed there is no truth as the statement above claims, that means the statement itself is true. Therefore there must be at least one truth - but then the statement becomes false. Dear readers, this isn't some clever little play on irony. This is proof positive that there does exist objective truth, and that the denial of that basic fact is ridiculous on its face. We then went to Holy Communion. I receive on the tongue. I could tell that Father was rather reluctant to give the Host to me, but He did. One of my companions made the same observation when she received from him. After Mass, we saw this flyer on the bulletin board in the lobby. We weren't surprised. 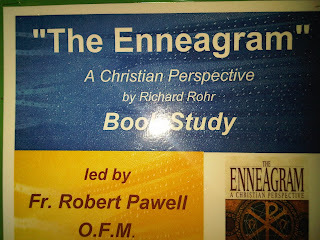 The enneagram is a device based on New Age heresy. Richard Rohr, to the best of my recollection, is another Franciscan priest; why the flyer doesn't acknowledge his priesthood is beyond me. At any rate, Father Rohr is heavily steeped in New Age glop. Chicago is the (reputed) hometown of the Messiah Most Miserable, the Lord Barack Hussein Obama himself. After seeing a church such as this, we can understand how Chicago Catholics were so muddle-brained as to vote for Obama. (Note to all the salivating lawyers out there. This blog and its owner-organization are NOT 501c3 corporations. Therefore, we can make any political-type of statement that we please.) Let's pray that God will break through the obvious confusion and rebellion that exists in such parishes. McBrien: "Eucharistic adoration..a step backward"
I learn something new everyday. In all my years of knowing that Fr Richard McBrien is a flaming heretical dissenter, I did not realize he taught at Notre Dame University. I guess he and Fr Jenkins must be the best of buddies. After the Obama debacle last spring, this drivvel from Fr McBrien is yet another reason why Our Lady weeps. Of course the McBrien diatribe is published on the webpage of the National Catholic Distorter, uh, I mean.. Reporter! He just cannot grasp why literate and educated Catholics would be interested in Our Lord in His Real Presence. Psst! Fr McBrien! I'll let you in on that secret! It is precisely because we are aware of our Faith (despite Moderist attempts to rob us of that) that we are flocking to Our Lord. Our world is in desperate need of Him. Perpetual Adoration as a Necessary Antidote for Abortion. Fr Hardon spoke extensively on this topic. The website www.lifeeternal.org will have much in the way of solid teaching. Well, what else can I call this cabal? Hats off to Glenn Beck. Had I not seen the Washington Times today and the article about his commentary, I never would have thought to examine the clown collection that is the Advisory Board for ACORN. After googling the board, I went to the Political Inquirer to get a brief sketch of this bunch. Now we know from where some of the ACORN bile originated. I'll highlight a few; the recitation of their names will conjure up unpleasant memories. First, there's John Posdesta. He runs the Center for American Progress, at the behest of George Soros. He also headed up Obama's transition team, which is more evidence of the cozy relationship between Obama and ACORN. Then we have Kathleen Kennedy Townsend. She also is on the board of Center for American Progress. In 1996, she gave an award to Patricia Jessamy, who today as Baltimore's top prosecuter, is trying to prosecute Hannah Giles and James O'Keefe for exposing Baltimore ACORN as a brothel advisory service. I tell you, Ms KKT has lots and lots of "advisory experience" under her belt! In July 2003, Cardinal McCarrick (then archbishop of Washington) called her and a whole host of dissident Catholics to advise him on the future of the Church. We wrote a letter to His Emminence; that point was the seventh point in our letter. Perhaps that partially explains his disregard for Canon 915 and other strange propensities. Moving along, we see Henry Cisneros. He was Clinton's HUD Secretary. He pled guilty to lying to the FBI during his background check. Did ACORN submit him to a background check? This collection of undesirables gives new depth of meaning to the term "garbage in, garbage out". When asked in an interview if he agreed with his brother cardinal, Justin Rigali, that there should be language in the Obamacare bill that explicitly bans public funding of abortion, His Emminence gave an eloquent, stellar answer truly worthy of his faith. My paltry words cannot do it justice, so let this grace your ears! C'mon, now! I didn't say this "faith" was the True Roman Catholic Faith now, right? This is "way beyond his field"? Gee whiz! I thought the teaching of faith and morals was right smack-dab within the purview of a Prince of the Church. The thinking (or lack thereof?) is interesting. Let's try that line of thought (using the term lightly) with another scenario. Reporter: "Do you think there should be language in the bill that explicitly excludes funds for wife-beating?" Mahoney: "This is way beyond my field (said dismissively). My field is immigration!" Had that been the conversation, the hue and cry for his resignation would be deafening - and rightly so. Doesn't this remind you of the ridiculous statement of the Messiah Most Miserable himself during his campaign? When pressed for his beliefs as to when life begins and thus is to be held inviolable from abortion, he said that "was above his pay grade." "Way above my pay grade", "way beyond my field".. I accept and agree with these admissions of gross incompetence and the refusal to grasp even the most basic tenets of common sense. Now that these incompetents have admitted their unsuitability to their respective tasks, let us pray that they have the grace to resign their lofty positions, lest they wreck more havoc than they've already done. Kathleen Sebelius, former Kansas governor and current Secretary of HHS has always been a flagrantly pro-abortion Catholic who has used her positions to promote baby-killing. As Kansas governor, she repeatedly used her authority to shield one of the most notorious abortionists, the late George Tiller, from the law that she was sworn to uphold. Her bishop, Archbishop Joseph Naumann, attempted to help her understand that her support of abortion was gravely sinful. After she flouted his private plea to refrain from Holy Communion, he publicly forbade her from Communion until she repents of her serious sin. In a press interview, she complains that this is painful to her, not recognizing that this is a discipline necessary not only to prevent dishonor to the Blessed Sacrament, but to prevent her from committing yet another mortal sin, that of sacrilegious Communion. Let us join Archbishop Naumann in praying not only for Sebelius's conversion, but that of all Catholics who support abortion. While we do not doubt Sebelius's pain, we also know that if she dies in a state of mortal sin, she will endure the eternal, horrible pains of hell. Let us also pray that more bishops will have the courage and clarity of Archbishop Naumann. We can make that an intention as we gather at St Matthew's Cathedral (see post below). The annual Red Mass will be held on October 4th, 10am, at the Cathedral of St. Matthew. It's held to coincide with the beginning of the new Supreme Court session. Of course all sorts of governmental and political dignitaries will be there. Unfortunately, because of the disregard for Canon 915 that has been shown by the local ordinaries, the Eucharist will be profaned and many will commit sins of sacriligeous Holy Communion. If you would be interested in joining us for an educational and prayerful presence outside of the Cathedral, please feel free to leave a comment, or email me at webmaster@restore-dc-catholicism.com. In the September 22nd issue of the Washington Times, on page A9, the American Society for the Defense of Tradition, Family and Property took out a full-page ad that examines the question of whether or not the state is obliged to provide health care. They have also publicized it on their own website. I commend them for their work and urge its study. Too many well-meaning (but not well-thinking) Catholics believe that if we just strip away abortion and other anti-life features from Obamacare, then it will be acceptable. They don't realize what a death trap they're swallowing, hook-line-sinker. They are flirting with socialism and thus the ultimate endangerment of all human rights. Guess Who Baltimore CCHD Is Funding? Just what stellar organization won grants in 2008 from Baltimore's Catholic Campaign for Human Development? Hint - you'll go NUTS over them! Yes. Catholics of Baltimore, watch the following (two parts ) to see your contribution dollars - at work! Now let's take a look at the Baltimore CCHD's 2008 Grants. Some careful examination is in order because this thing might be a bit tricky. For instance, look at the "National Economic Development Grants" section. What's the second item? Why, it shows that $35,000 was granted in 2008 to that same organization you just watched in the above video. Did you note the identical addresses? Just below that you read a disclaimer stating that "no national CCHD funds will go to ACORN.."
Well, that's nice! But what about local CCHD funds?? Go further down in that report - to "Local Grants". Does the recipient listed in item 4 look familiar? It would seem that between national and local CCHD, the would-be facilitators of underage prostitution received $45,000 of Catholic grants, funded (at least in part) by your donations during that second collection in November. Speaking of November, yet another CCHD pew shakedown is looming upon us. Once again, we are urging a total boycott of this collection. Instead, please give directly to a truly Catholic pro-life organization, such as Human Life International, American Life League, Priests for Life or a truly faithful religious order such as Marians of the Immaculate Conception or the Missionaries of Charity. The effectiveness of the boycott is magnified greatly if you communicate to the "boycottee" why they are being boycotted. Please go to this blog's sister site and scroll down halfway to the "Boycott the CCHD" posting. Therein you'll find some flyers that you may wish to put in that second collection envelope in lieu of money. Also, please see this page from the Catholic Media Coalition to see more ways that the CCHD monies are used to undermine Catholic faith and morals in public life. Now it's time for another guessing game. What was one major catastrophic result of the CCHD/ACORN collusion? Give up? Well, here's a hint! Yes, indeed. The Messiah Most Miserable got his start in Chicago as a "community organizer" for Alinskyite organizations such as ACORN. Currently ACORN is under investigation in several localities for alleged voter fraud - fraud that most likely put into the White House a most dangerous occupant - for the unborn children, the vulnerable sick and elderly and Christian civilization at large. I generally don't go to Saturday evening Masses, as the Vatican II council stipulated that such Masses were only to be attended when emergency prevented attendance on Sunday, the preferred day. Occasionally, such circumstances do occur. On Saturday, Sept 19th, I had need to attend the 5pm Mass at St. Rose of Lima in Gaithersburg, MD. Many years ago, when I worked on Firstfield Road, I would attend daily noon Mass there. I quickly discovered the left-wing proclivities of the clergy present at the time. It didn't take long for me to notice that the assistant priest was engaged in "polticially correct" editing of the readings, substituting those nasty male sexist pronouns for more, uh, "acceptable" alternatives when referring to Jesus. The pastor's descent into liberal la-la land was worse. He would "invite us to gather around the altar" at the time of the Canon and Consecration. I and another traditionally-oriented person would remain in our pews. One day, after one of his invitations, the pastor stopped Mass to mock us - from the altar - for remaining in our pews. We both stood (or more accurately, knelt) our ground. I understand that things have changed for the better. When I walked in, this is the first thing that I saw. These items are not much more than nik-naks that one might find adorning a bookshelf. The left thing appears to be a decorative dish stood on its side with a prop. At any rate, there is nothing about that display to inspire worship or at least thought about Our Lord. In fact, except for the Stations of the Cross (which were decent enough) and a strange crucifix, there was not one statue in the Church. The church building is essentially one big circle. The pews are arranged in a full circle - not semi, but full - circle around the altar. Th alter is that strange-looking table in the center, raised on a platform. A strip of platform goes back to the end of the church where the tabernacle is. Note that everything - altar, flower pots - seem to be perched on wrought iron. I can only hope that there is indeed an altar stone under the linen. Here's the tabernacle. As I said, it's made of wood and it's rather nondescript. Canon law 938 S 2 states that "the tabernacle...is to be situated in some part of the church that is distinguished, conspicuous, beautifully decorated and suitable for prayer." This tabernacle is none of these. As mentioned before, the church pews are all in a circle. The tabernacle is towards the back. There are pews with their backs to the tabernacle as they face the altar. Notice in this picture the woman with her back towards Our Lord in the Blessed Sacrament as she chats with someone else. I'm happy to report that while the readings were read, there was no substitution of "inclusive language" as in years past. There was way too much applause during Mass, and of course at the sign of peace, everyone trotted everywhere. The priest left the sanctuary, as he's not supposed to do. However, given the structure of the church, it is difficult to tell where the sanctuary ends. As I left Mass and pulled away, I did notice a car with an Obama sticker on it. This didn't surprise me. I left on that car a Wisdom on Windshields flyer and hope that the owner took it to heart. By the way - download your own copy of that flyer and have them handy when you go to Mass. You never know who may need some solid social-teaching catechesis, especially with the 2010 elections looming near. Hats Off to Father Landry! Father Roger Landry is editor of The Anchor, the official publication of the Diocese of Fall River, Massachusetts. This was the home diocese of the late Senator Edward M. Kennedy. Most thinking Catholics were aghast at the sorry spectacle of Cardinals honoring a man who spent much of his life and influence to participate in the murder of countless babies. During this profanation of the funeral liturgy, various Kennedy relatives engaged in Democratic infomercials, thinly disguised as "Prayers of the Faithful". One of those prayers was for the acceptance of the gay lifestyle. Enter Father Landry, who wrote a series of columns that shed the light of the Magisterium upon the debacle that occurred in the diocese. In one of those columns, he wrote that "all that was necessary was to adhere to the letter and spirit of the Catholic funeral rite." How can it be stated more simply and plainly? Furthermore, he wrote that "Kennedy's example was so injurious because the pastors of the Church, for the most part, made the imprudent call to do little or nothing about it beyond general teaching statements that they hoped offending politicians would apply to themselves." Father is right. The fact is that naughty little children simply will not police themselves. In reading this last statement, we cannot help but be reminded of the sad example provided by Archbishop Wuerl. When asked if he would enforce Canon 915 during an interview, alleging a preference for a "teaching approach." By the clear unwillingness to take action, it's clear what is really being taught to pro-abortion proponents. Pray that 1) Father Landry suffer no unjust treatment from the USCCB hierarchy (like Bishop Martino?) for his courageous stance, 2) that his words be heeded and 3) for the repentance and conversion of all pro-abortion "Catholic" politicians. On September 25th, busloads of Muslims will pour into Washington DC to celebrate what they call a day of prayer. Their slogan for the event is "Our Time Has Come". We can only guess what that means! Pursuant to the Christian's responsibility to offer witness in the face of heresy and idolotry, Christian Women in Action will be conducting a Jericho Walk in Washington on that day. Click that link for further details and contact information. Please spread this word along! The principle of subsidiarity, described in Pope Pius XI's Quadragesimo Anno and Pope John Paul II's Centesimus Annus certainly seems to be "An Inconvenient Truth" (to borrow Al Gore's term) a goodly percentage of the United States bishops. It certainly seems to be so for the USCCB and for many of the state Catholic conferences. It almost seems that there isn't a governmental handout after which they won't slobber and pant. It even seems that Renato Cardinal Martino, a former Vatican official known for his rabid liberalism, has lavished praise upon Obamacare, inherent and fatal flaws nothwithstanding. It is therefore most refresing to see that some US bishops realize the peril that Obamacare poses to true Catholic social teaching, regardless of the presence or absence of abortion and euthanasia. Let us be clear; the specter of taxpayer-funded abortion and euthanasia is horrible beyond description. However, the elimination of these murderous provisions from the bill will not render the bill any more acceptable to the true Catholic. The presence of socialized medicine foists its own deadly and yes, sinful poisons upon civilization. Please read and study the linked articles closely. In the September 17th edition of the Standard, on page 4 hard copy (but here, for your ease of reference), we read "USCCB, CHA officials encouraged about Obama's address on health care." Encouraged!!???!? Maybe we should send Joe Wilson over to the USCCB offices to explain to them some painfully obvious facts about the lack of credibility of the Messiah Most Miserable. There is not one unborn child, nor elderly person, nor anyone frail who is not imperiled by this satanic monstrosity known as HR 3200. Of the USCCB's willful oblivion, we find ample evidence here. We've already commented on that on our site in the "national news" section, so there's no need to reinvent that wheel. We've no doubt that they deliberately made themselves scarce during this weekend's massive Tea Party in Washington, DC. We were there, along with at least one million others. Given the truly diabolical provisions in this health care bill, and in fact inherent in the very concept of socialism in general, we believe the picture below displays the true Catholic view of the Obama Care mess. We step into the blogosphere! With this entry, Faithful Catholics of MD/DC, Inc moves into the blogosphere. Our website http://www.restore-dc-catholicism.com/ remains online and will at this time serve as a repository of downloadable resources and post archives. We will refer you to that from time to time.